As fears of an escalating US-China trade war and uncertainty over Brexit abound, globally, companies’ appetite for M&A has fallen to a four-year low, according to EY’s biannual ‘Global Capital Confidence Barometer’ report. Forty-six percent of global executives say that they plan to buy other firms in the next 12 months, a 10 percent decline from the previous year, according to EY. A further 46 percent of respondents to a survey of more than 2600 executives across 45 countries also said they saw regulation and geopolitical uncertainty as the biggest risk to dealmaking activity over the next year. The escalation of tension between the US and China has already led to an increase in tariffs, Brexit too could drive a tariff increase, though the outcome of the Brexit negotiations is still unknown, despite the close proximity of the UK’s March 2019 exit date. The outcome of the Brexit negotiations is causing some consternation and is a key focus for those executives surveyed. Forty-one percent of respondents would prefer the UK to enter an Economic Free Trade Agreement similar to Switzerland, while 22 percent would prefer a Free-Trade Agreement model similar to that between the EU and Canada. Five percent of executives globally prefer a second referendum of the UK’s EU membership, and 6 percent would prefer a World Trade Organisation rules-based outcome. Despite the increased uncertainty and decline in global dealmaking appetites, confidence in the M&A market remains high. Ninety percent of respondents expect the market to improve over the next 12 months. For some companies, the coming year will enable them to focus on integrating the deals they have completed over the last few years. 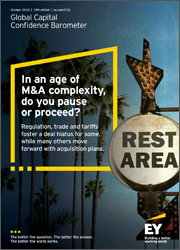 Indeed, some companies intend to use M&A to overcome the ongoing global instability. Twenty percent of executives noted that they are focusing more on international opportunities, including within the UK, which is the number two M&A destination of choice for executives globally, up from fifth position in the April 2018 survey.